CAT HEAD DELTA BLUES & FOLK ART is a world-famous blues store filled with CDs, DVDs, books, magazines, T-shirts and artwork ... as well as a clearinghouse for live music happenings in the Delta. It is home base for Blues Revue's "Down In The Delta" column, radio's "Cat Head Delta Blues Show," the Cat Head Presents record label and joint projects like the blues film "M for Mississippi" and "We Juke Up In Here!" 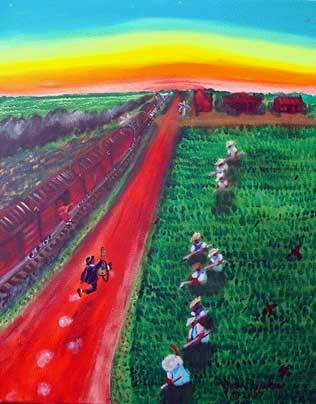 ALSO, buy Cat Head owner Roger Stolle's new book "Hidden Hidden of Mississippi Blues" from The History Press. 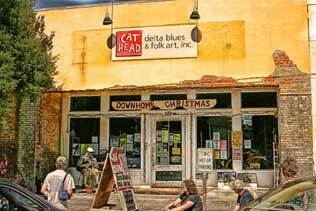 Cat Head received a coveted "Keeping The Blues Alive" award in 2008; it was hailed as "One of the 17 Coolest Record Stores in America" by Paste Magazine; and it was recently included in the book "1,000 Places to See Before You Die." Owner Roger Stolle also conducts a weekly call-in to Bill Wax's Bluesville radio show on XM/Sirius Radio most Thursdays at 4pm (CT). 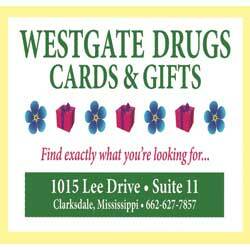 Live music info and a guide to Clarksdale are featured on the store's web site, www.cathead.biz. 252 Delta Ave. 662-624-5992. Coahoma Collective is a new nonprofit with a mission to catalyze arts-driven, community-inclusive revitalization in downtown Clarksdale. The Collective has two big projects in the works in 2018: we are developing the Travelers Hotel, a 20-room hotel located at 212 Third Street, slated to open in early 2019; and we are the new owners of 145 Delta, the site of the former Miss Del's General Store. A new retail/garden store will open at 145 Delta soon, which will be owned/operated by a group of artists who will live upstairs! Both sites will feature community gathering spaces, and will host performances and events. Keep in touch, learn about upcoming events, and say hello by following us on Instagram (@travelers_clarksdale) and Facebook (www.facebook.com/CoahomaCollective). Tues - Sat 9-5. Our mini mall is a unique representation of our local artist as well as vendors. Something for the entire family, from handmade jewelry, children's clothes, peace t-shirts as well as our special sale items for the blues. Located in the heart of downtown Clarksdale on the corner of Delta Avenue and East Second -Tuesday thru Saturday 10 am to 5 pm. FESTIVAL HOURS: Open Thursday, April 9th & Friday, April 10th 10 am to 4 pm. Saturday, April 11th 10 am to 5pm. Also, set up at Shack Up Inn Thursday - Sunday. 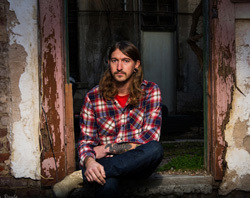 Joey Young, potter and painter. "Mag-Pie Gift & Art is a gift shop in downtown Clarksdale, MS. We sell china, silver, cutlery, serving pieces, home decor items, art, children's clothing, baby books & accessories, lamps, furniture, stationary, gifts and more! We have Mississippi made items, food products, books, kitchen accessories, pottery and other items for your house, showers, birthday gifts or just a keepsake to take home. Wedding and baby registries are available. 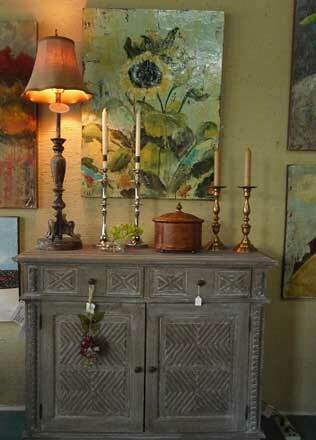 Stop by our shop on Delta Avenue and see all we have to offer!" 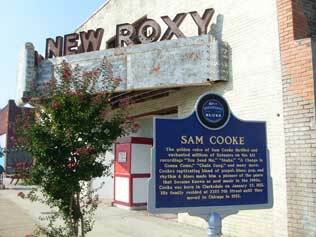 The New Roxy is a former movie theater located in the Historic New World District of Clarksdale Mississippi. Renovation began in 2008 after sitting vacant and deteriorating since the mid 1980�s. What remains physically is a shell of the former theater�. a sloping concrete floor, masonry stage, distressed yet beautiful brick walls, a gorgeous view of the night sky and a fabulous feeling that can only be understood when you stand inside. We are currently open only for special events which often feature live blues music. Come join us as we try to recapture some of the rich history and culture of this once vibrant and important neighborhood in the heart of the Delta. Store Hours: Tuesday - Friday 10am-5:30pm Saturdays 10am-2pm Instagram: @shopoakandivy Come see downtown's newest nature boutique. 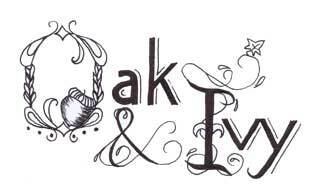 Susan Flowers and Erica Eason Hall have partnered to bring you Oak & Ivy: Designs Inspired by Nature. Treat yourself or warm a friend's heart with a unique design for everyday home or office occasions. Or call these ladies for your next special event! 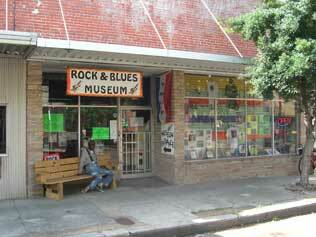 Description: Museum Extensive collection of memorabilia from 1920's through 1970's, special room with exhibits of local bluesartists. Giftshop check website for openingtimes.